During the 2018-19 season, the WWS will be conducted by three music director candidates. Pratik Gandhi is a conductor, percussionist, and clinician based in Toronto. 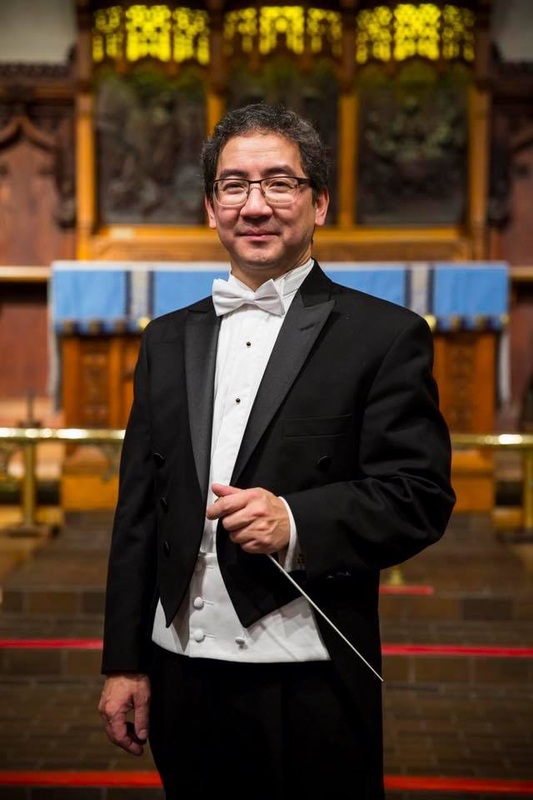 He currently serves as music director of the Rouge River Winds and of Soup Can Theatre, and resident conductor of the Toy Piano Composers Ensemble. He also recently completed a five-year tenure as assistant conductor of Symphony on the Bay, and an apprenticeship with Orchestra Toronto under Kevin Mallon. In frequent demand as a guest conductor and adjudicator across southwestern Ontario, Pratik serves as adjudicator and Vice-Chair (Syllabus and Sight-reading) for the concert band division of MusicFest Canada, as well as syllabus coordinator for the OBA Concert Band Festival. He recently adjudicated concert bands at the 2017 Alberta International Band Festival in Calgary. Pratik regularly presents workshops on repertoire, percussion pedagogy, and technology, including a recent workshop on the use of social media in the music classroom for the Ontario Music Educators’ Association. Pratik’s conducting experience covers a wide variety of genres and repertoire. He has led orchestras in performances of symphonies, concertos, and overtures; he has served as music director for stage works including operas, musicals, and cabarets; and he has conducted chamber ensembles, wind bands, choirs, and many different collaborative projects. Collaborative music-making is one of Pratik’s passions, and he particularly enjoys directing works for multiple performing forces. 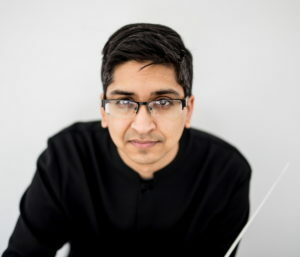 Pratik is also a champion of new music, and has conducted the premiere of numerous works, including Jodi Vander Woude’s Quiet you with my love: lullaby, for soprano solo, female chorus, and large orchestra, and Kristie Hunter’s Stronger Than, for orchestra. Pratik received a B.Mus. in music education and an M.Mus. in conducting from the University of Western Ontario, where he studied conducting with Dr. Colleen Richardson, Jerome Summers and James McKay, and percussion with Dr. Jill Ball. He received numerous entrance and in-course scholarships and awards, including the Western Scholarship of Excellence, the London Music Scholarship Foundation Endowment Award, and the Silver Medal for Excellence in Leadership. During his graduate work, he also founded and directed a string orchestra called Gli Archi, which presented two full-length concerts and recorded several new works for local composers including Anthony Aceti and Jeff Smallman. Visit Pratik Gandhi’s website. With a Bachelor of Music from the University of Calgary, and a Bachelor of Education from Queen’s University, Amy McLennan has taught music at the elementary and secondary levels nation-wide for over a decade in both English and French. Amy has earned awards from the Ontario Band Festival, the Alberta International Band Festival, Kiwanis Calgary, and Musicfest Canada for outstanding musical performances with her beginner, junior, and senior high school bands. She has been a guest conductor for various honour groups and continues to work as an active clinician. Amy has also lead national and international musical tours, taking her senior high school concert band to Europe in 2014 where they traveled through Portugal, Spain, Italy, Austria, and the Czech Republic. As a passionate conductor, Amy attended the Canadian Wind Conductor’s Development Program in Winnipeg for two years, as well as spending time at The Juilliard School in New York City to further her conducting artistry. Working alongside her mentor and teacher Dr. Glenn Price, Amy was the Associate Conductor of the University of Calgary Wind Ensemble during the 2010-11 academic year. She has also successfully led community organizations such as the All-City Wind Ensemble as a part of the UCalgary community music program, Voix des Rocheuses (Calgary’s Francophone choir) and most recently, The Mississauga Pops – a group focused on entertaining audiences both young and old with a variety of pop, jazz and classical repertoire. 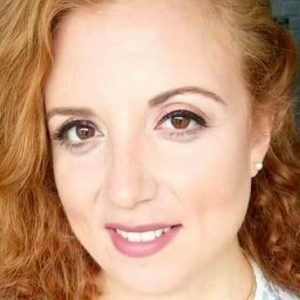 Amy currently works as the senior music teacher at Holy Trinity School, a co-ed university preparation school in Richmond Hill, Ontario where she leads the Intermediate and Senior Concert Bands, as well as the Senior Jazz Band.